"Being able to bring the experience of a live concert to the living room is unbeatable, and with our vast library, consumers will always have something new to watch." 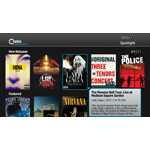 SARATOGA, Calif.--(BUSINESS WIRE)--Qello Concerts launched on the Roku streaming platform today, bringing users access to the world’s largest collection of full-length HD concert films and music documentaries on-demand. The Qello Concerts Roku channel offers unlimited access to thousands of hours of concerts and documentaries from every genre, including The Rolling Stones' "Live at the Max" and Lady Gaga's "The Monster Ball Tour: Live at Madison Square Garden," as part of an All-Access Pass subscription for just $4.99 a month. Additionally, subscribers can watch performances from artists, new and iconic, like Jimi Hendrix, Beyoncé, Jay-Z, Eric Clapton, B.B. King, Plácido Domingo, Queen, Imagine Dragons, Nirvana, Mumford & Sons, My Morning Jacket, TobyMac, Barbra Streisand, and much more. Roku users new to Qello Concerts can try the All-Access Pass for free by installing the channel on your Roku device and selecting “Start a 7-day free trial” when you launch the channel. "Our users not only love to stream TV shows and movies, but enjoy accessing music on their Roku streaming players too. We’re excited that the addition of Qello Concerts to the Roku platform elevates their music streaming experience with more amazing content," said Ziba Kaboli-Gerbrands, director of content acquisition and business development at Roku. "Roku is a great partner for Qello Concerts," says Brian Lisi, CEO of Qello. "Being able to bring the experience of a live concert to the living room is unbeatable, and with our vast library, consumers will always have something new to watch." The Qello Concerts channel is available on all current-generation Roku players, including the new Roku Streaming Stick™ (HDMI™ version) and the flagship Roku 3 player, joining more than 1,200 video, music, and other channels already available on the Roku streaming platform. Qello is a digital entertainment company that streams HD quality content across multiple platforms to millions of users in more than 160 countries. Qello's first vertical, Qello Concerts, gives users on-demand access to the world's largest collection of HD concert films and music documentaries spanning all musical genres from new to iconic. Qello Concerts is available on all iOS devices, all Android devices, PlayStation, Microsoft Mobile, Samsung and Sony Smart TVs, Amazon Kindle Fire, Roku, and the web at www.qello.com. Roku is the creator of the most popular streaming platform for delivering video, music and casual games to the TV. The Roku platform features the largest collection of entertainment available for streaming to the TV and is accessible through Roku streaming players, the Roku Streaming Stick, Roku Ready® devices and later this year on Roku TVs™. Roku products are sold in the U.S., Canada, the U.K. and the Republic of Ireland. Roku was founded by Anthony Wood, inventor of the DVR. Roku is privately held and headquartered in Saratoga, Calif., U.S.
Roku and Roku Ready are registered trademarks and Streaming Stick and Roku TV are trademarks of Roku, Inc. in the U.S. and in other countries.